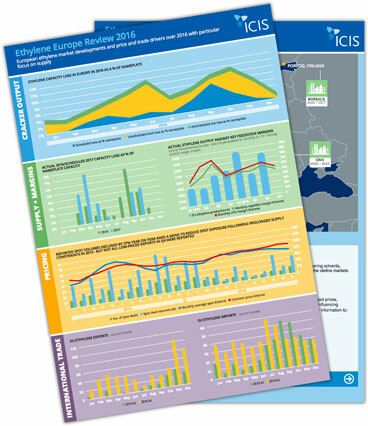 The ICIS European Ethylene Review of 2016 provides an at-a-glance reference view of the key features of the ethylene market throughout the course of the year using ICIS pricing data, together with trade statistical data from Petrochemicals Europe and Eurostat. While ethylene supply improved in 2016 versus 2015, concerns over a possible repeat of 2015’s unprecedented level of unplanned cracker outages saw increased volumes and/or heightened offtake flexbility secured through contracts, while underlying demand in general remained strong throughout. Both reduced spot exposures and improved production reliability meant there was less demand for spot tonnes and hence fewer spot volumes being recorded traded. Above-average cracker margins continued to be enjoyed by European cracker operators although cracker margin averages declined by 2% and 8% for naphtha-based and LPG-based margins respectively from 2015 to 2016. Firm contract margins kept many crackers running at relatively high rates in the fourth quarter, when domestic demand is traditionally at its seasonal low, allowing for exports. Export activities, primarily to Asia, were a key feature of the market in November and December.